Ah, the magic of the internet! It allows us to see amazing things from the comfort of a favorite chair when just twenty years ago we would have been out of luck. 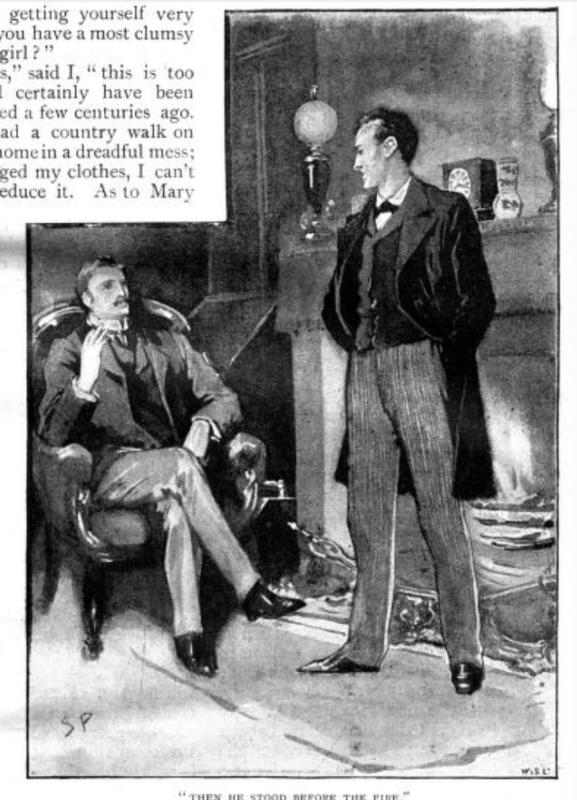 I was reading The Great Detective by Zach Dundas at lunch today and he was talking about the beginnings of the Sherlock Holmes stories and how they took off when the second Holmes story appeared in The Strand Magazine in July, 1891. He mentions you can read it on your iPad. He talks about the stories and illustrations not only in the Conan Doyle piece but in the whole magazine. It is in the Strand story, “A Scandal in Bohemia,” where the first drawing of Sherlock Holmes was made. It is a drawing that set the stage for how we still picture the great detective. And I thought, oh how neat! It would would fun to see it. But just on that alone I really had no plans on trying to find it. 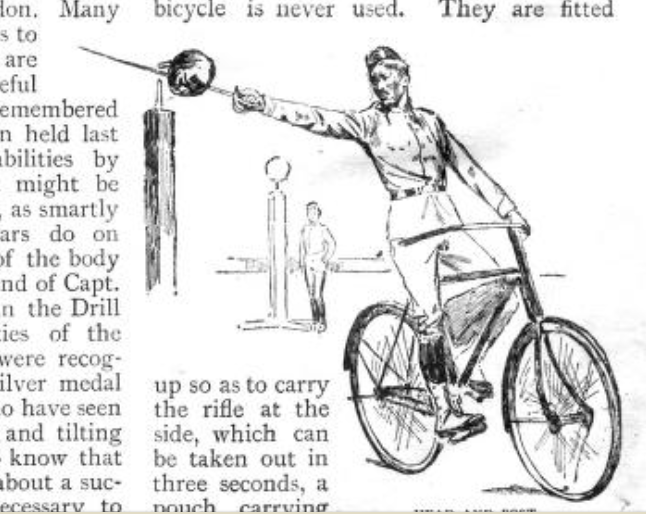 Until, that is, Dundas mentions an article in the same issue called “A Regiment on Wheels.” It is about a military regiment of bicyclists and there are illustrations demonstrating, among other things, a cyclist decapitating someone with a saber while riding his bike! Now that I had to see! 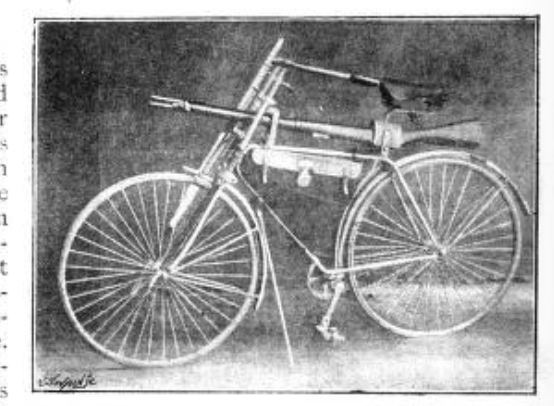 Swords & bikes – who knew? cyclist decapitating someone with a sword, totally worth the effort to find. The Internet Archive has the magazine, volume 2, number 7. You can view it online or download it as a PDF or several other file formats. Nifty. To my credit, I found the Holmes drawing first and yes, he is exactly how you imagine him. I did not linger long, however, there was a decapitation to find! Of course it ends up being a bit disappointing. The cyclist isn’t actually decapitating a person but merely practicing by knocking a “head” off a post. I’m not entirely certain what I was expecting to see, but it wasn’t that. Nonetheless, it is an impressive skill to have and I might begin practicing it on my own bike. Perhaps I will use a stick though since I don’t imagine my neighbors would appreciate me riding up and down the street with a sword in my hand. There are children on my block after all. They would think it was cool and want to try too which would not endear me to their parents and I need to make sure my neighbors like me at least until I get them to sign off on my chicken permit. Then look out! I’m going to pimp my bike and when the zombie apocalypse comes I will be ready to make some zombie heads roll. Perhaps a stick first, then a lightsaber. You do need to know how to wield “swords” of different weights. I actually have a fat volume of Holmes stories that contains facsimilies of those original Strand publications- illustrations and all. They’re a bit hard to read because the text looks worn, but I love seeing the pictures. But I have another Holmes collection that’s the complete works- all the short stories, all the novels- no pictures. I have these two huge volumes on my shelf because I can’t decide which to keep- the hard-to-read lovely illustrated on that’s incomplete, or the other… So redundant. Jeane, oh that is a dilemma! If only you could somehow combine the two into one book for the best of both. Ah the joys of the internet. You have to appreciate a story that features cyclists in just such a way–what bizarre training, however…. Who knows when a skill like that might come in useful! Danielle, I know, right? A totally useful skill. Though Bookman thinks he should learn how to shoot a gun while riding a bike. We will all be safer if he does not attempt it.